1. All water consumed on property is from a reverse osmosis system. 2. All irrigation on the property is from a ground water collection system. 3.All hot water provided is from "on demand" hot water systems. 4. Much of our new lighting is LED. 5. All new appliances which are energy smart. 6. 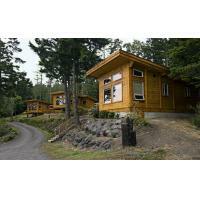 Technologically advanced septic treatment system, 1 of 3 on San Juan Island. 7. Use of reclaimed products in resort. Visit Snug Harbor Resort & Marina to see why so many visitors return year after year. 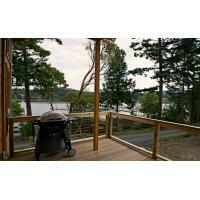 This San Juan Island vacation resort, located on peaceful Mitchell Bay, offers waterfront cabin accommodations and water view camping year round. Our sheltered marina is a great place to moor your boat. We are perfectly located for adventures throughout the islands. 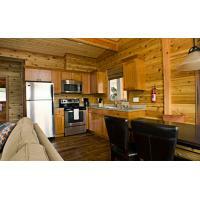 New for 2012 we have added three deluxe cabins, one 1 bedroom and two 2 bedrooms. 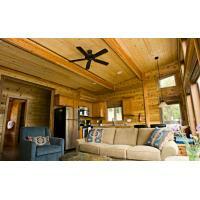 These cabins have vaulted ceilings, lots of glass and are extememly comfortable and well outfitted. We also opened, Mitchell Bay Coffee. We offer a wide variety of espresso drinks, coffee, italian sodas, waffles, soups, cookies, etc.. No better way to start your day than with an espresso, on your deck, enjoying the tranquil view of Mitchell Bay. When you come to Snug Harbor be ready to detach a little. While we have free wi-fi throughout and cell phone service, there are no phones in our cabins. Choose from comfortable Nor'wester Cabins with lofts, the rustic Panabode studio or two bedroom units, or our popular "Tree House". A relaxing evening is best spent enjoying the sunset, barbecuing and exchanging stories with other guests around our beachside fire pits. We are pet friendly, so feel free to bring the four legged members of your family. 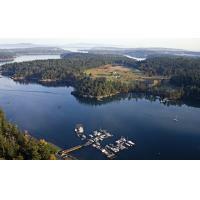 Snug Harbor Resort is one of the best values on San Juan Island. 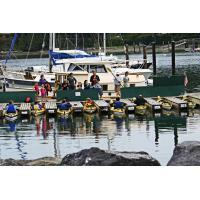 Just outside Snug Harbor's protected marina the Orcas pass seemingly on a daily basis. 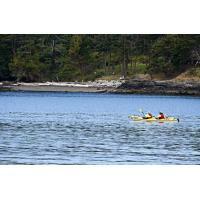 Whale watching and sea kayaking tours leave daily from our docks. The fishing grounds are just outside the bay and crabbing is fantastic right out front. We even have complimentary kayaks and canoes for use by our guests. 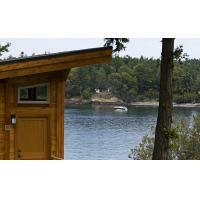 Snug Harbor is only eight miles from the seaside town of Friday Harbor, with it's many shops and restaurants. Visit nearby Lime Kiln State Park, considered one of the best places in the world to view whales, or English Camp National Historic Park to take in the colorful local history. 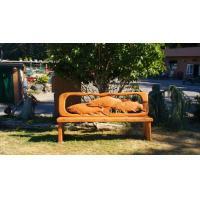 The Westcott Bay Sculpture Park offers more than 100 pieces on outdoor display. 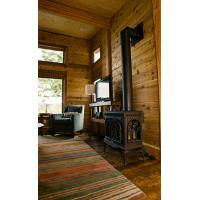 Let us help you plan your San Juans vacation retreat. Reservations are recommended, but walk-ins are welcome. Try out our new on line reservation system. Your visit to our beautiful island will truly be an exceptional experience. 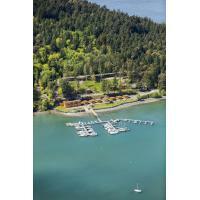 All the renovations for Snug Harbor Resort will be completed by June 30, 2014. Mitchell Bay Coffee will reopen on June 15, 2014. 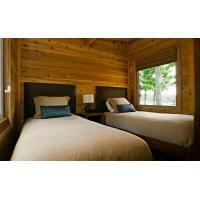 Come on down and see the new Snug Harbor Resort and the new Mitchell Bay Coffee. Snug Harbor now offers event space in our new facility including seating for 60, full kitchen, full AV capabilities and a private waterfront patio.